Technology has been improving our kitchens year on year, helping us not only with our cooking but also our lifestyles. The kitchen is the hub of so many households: the place where families come together to live, eat and socialise. With a few of these new or soon-to-be-made appliances, your kitchen can not only be a place where you cook but a place where your family can relax or work while you whip up a dish. These gadgets may not make your kids eat their vegetables, but they’ll certainly make your kitchen look cool, comfortable and efficient. So here they are: 4 of the best pieces of technology either already or soon-to-be available for use in your kitchen. 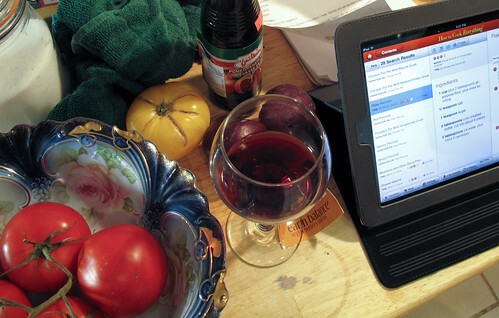 You might ask why an ebook reader makes a list for a cool piece of kitchen technology, but you’d be surised at how a voice-controlled ebook reader could transform your kitchen. Although accessibility developers will certainly have the disabled in mind when voice-controlled ebook readers become available, they will be great features for people who cook as well. By being able to turn the pages of the electronic cookbooks without touching the screen, you will be able to make keep the device clean and safe while also getting much more use out of any cookbooks that you have in ebook format. If the kitchen is the focal point of your household, then you will really get use of out the new trend of WiFi enabled Fridges with built in LCD screens. Examples like the Samsung RF4287HARS and the LG TV Refrigerator at their most basic allow you to view things like recipes, the weather and a calendar, but their functions don’t top there. The Samsung model for example allows you to install apps like a smartphone, meaning that your fridge becomes an electronic noticeboard where you can organise family events, place recipes from online or from your cookbook, view photos and so much more. What’s more, the cool factor of the fridge really gets kids into the kitchen and perhaps in a position where they can be wrangled into learning a bit about cooking. Although still a concept rather than something actually on the product line, Philips Green Cuisine Concept is an idea for a neat worktop that can cook, cool and store food with ease. Selective parts of the worktop will intuitively adapt to your needs, allowing you to cool wine bottles on the same surface that you fry an egg and place your cookbook. The main pushing point of the concept it its green credentials. For example on the ‘smart kettle’ will be able to sense how many cups are placed near it and only boil the correct amount of water: saving energy and the planet one mug at a time. The idea is supplemented by the fact the entire island counter is actually also a composter, allowing you to dispose of waste directly under the worktop that will then compost and allow you to grow herbs and vegetables. All in all a very cool possible appliance. Considered for too long to be frivolous and wasteful appliances, dishwashers are making a comeback with some cool new features that are enhancing their usability and their green credentials. One example of the potential future of dishwashing was the Brivia in-sink dishwasher, which placed under a second sink can double as an extra-deep sink if need be. Counter-top dishwashers, that wash small loads, have also seen a resurgence. These energy efficient appliances are small, but they can wash all the dishes from last night’s dinner for less energy and water than cleaning them by hand. That all for a lot less effort. This is guest post by Victoria Abrams. Ocassional guest blogger on health&fitness and a full time blogger on anything food related. Vic now represents Nigella Laswon a word famous English food writer, journalist and broadcaster.